We have just released Joocial v7.4.3 Beta. This version comes with the first prototype of the Social Composer. What is the Social Composer? 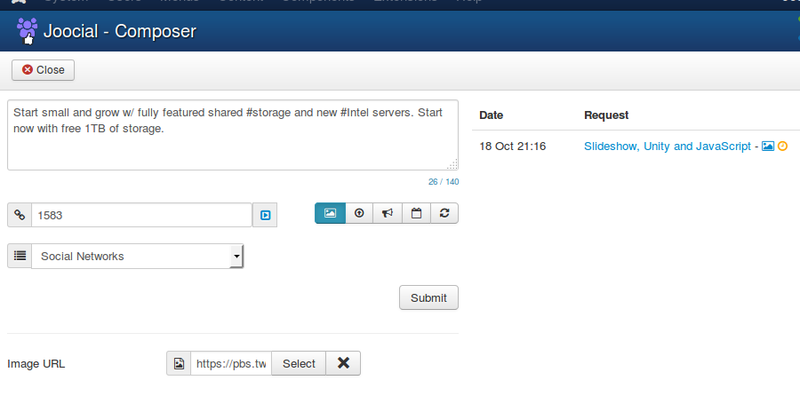 It is a brand new tool to manually create social posts for Joomla!. It is integrated with whole AutoTweet - Joocial hub, thus content requests follow the same rules and integrated social channels for publishing. From a technical point view, the new tool is an AngularJS application, living in its own right inside the Joomla! ecosystem, integrated with all extension enabled by AutoTweetNG and Joocial. Right now, the Beta version includes a non-functional editor to show the upcoming features. To check it, you can download and update your site to this version, or review the following screenshots.